The Hawker Sea Fury was designed and built by the same company that built the Hurricane which served so well during the Battle of Britain. It was developed as a carrier-borne aircraft from the RAF version, the Fury. The Hawker design team later went on to build the Hunter jet fighter and then the aircraft which entered service as the V/STOL Harrier. Great Britain leading the world again! The Sea Fury was flying at War’s end but did not see active service until the Korean conflict during which it gave a good account of itself. Powered by an enormously powerful Bristol Centaurus that could generate more than 2,500 hp it operated from the Navy’s carriers and packed a very powerful punch with its armament. 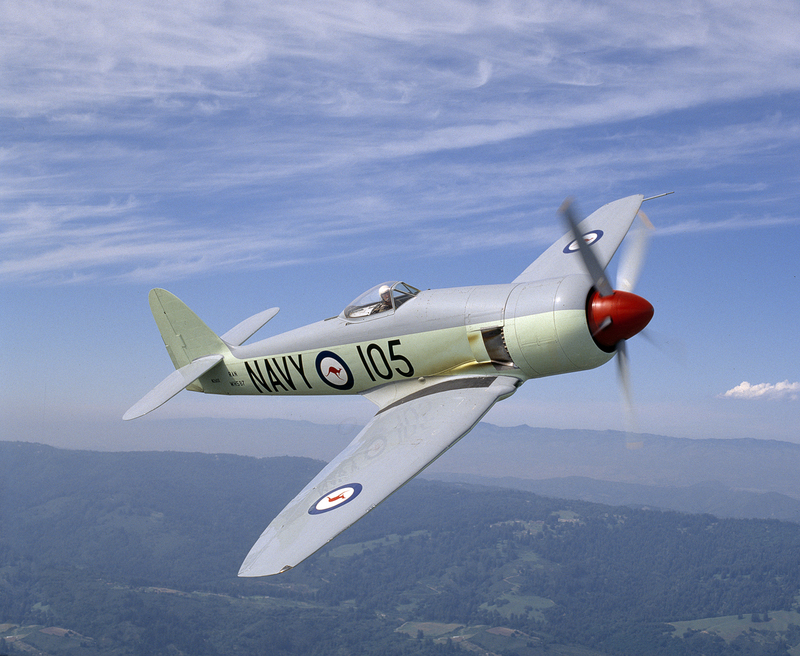 The Sea Fury was, arguably, the most powerful piston-engined fighter ever built. This particular example, painted in Royal Australian Navy markings, was photographed over California in May 1995 being flown by its owner Ellsworth Getchell, or ‘Getch’ as he was known to his friends. Getch was always keen to fly and I never needed to ask him if would like to go along on a shoot.